Striding Against Time to the Beginning. Lifeless, Dark, and Deep Beyond Measure. With the Ineffable Word of Creation. And the Waters Dried, and Land Arose. Yet Every Light Casts It’s Shadows. The Dark Waters Drew Back Yet Further. At the Ends of the Earth, Demons Rose. Yet Envious and Devoted to Destruction. Bright and New Was the Youth of the World. The Demons Whispered to the Barbarian Horde. Teaching a Dark Shadow of the True Ways. Bringing War and Blades of Iron Death. Demons Flowing Hidden Within Barbarian Veins. Was Entrapped, and Did Not Return to Them. And Demons Press It’s Borders. And the Heavens and Earth Die with Them. We Go Unwilling into the Final Night. Reclaiming Their Immortality and Powers. Oh come on! Aren’t they magical nexi in pretty much every setting ever? There are some conventions that you just can’t break! Aegypt had been invaded before; the people of the Young Kingdoms – the Libyans, Nubians and Assyrians – had all launched attacks. There had been deaths, the sacking of villages and border towns, and sometimes that had even seized a village or two – but the magic of the priests of Aegypt reigned supreme. Waves of invaders had broken upon the bulwarks of the Gods, who’s might none might gainsay within the circles of the world. But beyond the Borders of the Earth, the Shadows of the Gods, Apophis’s Spawn, watched and waited. To the Young Kingdoms they appeared as “Gods” of their own – primitive, unjust, and brawling, but theirs, as the distant powers of Aegypt were not. When Rome was founded in the Wild Lands, the hands of Apophis’ Spawn were upon it – and they concealed their power, the devouring strength of the Dark Waters beyond the World, in the blood and banners of it’s people, suckled upon the wolf’s teat. When the Legions of Rome marched on Aegypt, the priests once again turned the primordial powers of the Gods against the invaders – but this time, as the Legions fell, the powers that were used against them were stolen by the lurking darkness, and did not return to the Gods. Their ancient might, the foundation and sustenance of the world, was shaken, and the earth shook with it, vomiting fire and ash to darken the skies. In every temple the priests saw dread portents and onrushing doom – for the Gods, bereft of the power to defy time, were suddenly senile, and dying – and the earth would perish with the Gods that sustained it. But in that dark vision was a glimmer of hope; the power of the Gods could not be carried back into the void beyond the walls of creation. The demons who held it were trapped in their turn, caught within the circles of the Earth until the world’s end – which approached all too swiftly – or until they are slain, and the power they have stolen freed to return to the Gods. As for the Gods themselves… they could be sustained for a time by the meager energies of mortal men, offered to them through their altars, in contests, and in rituals. And so sacrifices were offered up in a steady stream; a tithe of contests to invigorate, rituals to soothe, and lives to sustain, the gods while the people of Aegypt went forth to hunt down the Spawn of Apophis – and to conquer, to send resources back to Aegypt that the sacrifices might continue and the world be sustained thereby. Numidia, Italia, Macedonia, Galatia, and Judea, the Circle of the Young Kingdoms, all were gathered into the great Aegyptian Empire as sources of contests and sacrifices, as bases for suppling expeditions into the Wild Lands in pursuit of the Spawn, and as sources of slaves and taxes to support the great quest. While unrest seethes within the conquered lands, and the beast-men of the wild lands follow demonic leaders and seize the chance to attack, many of the great Legions of Rome, Beastmasters of Numidia, Heroes of Macedonia, and even Visionaries from Galatia and Judea are called upon to join the great hunt. Sadly, some hear the siren call of rebellion more clearly – even if such a path leads ultimately to the destruction of the world. Still, if any effort of the People of Aegypt can be enough, the Gods, the Earth – and their Children – will live. It’s always convenient to have some clear goals for a campaign. Here it’s pretty simple; maintain stability, sustain the gods, gather allies, and hunt down the Spawn of Apophis – or watch the world end. OK, maybe it’s not necessarily all that simple – but it’s certainly clear. Divine Magic: While the powers of the Gods, and the magic that their priests can draw from them if they must, are still the greatest force within the Circles of the World, the greater magics now require mighty rituals, contests, and sacrifices to replace the power that they draw from the gods – and their priests much devote a good deal of their time to soothing and maintaining their dying Gods. Lesser magics are still fairly readily available however, and extend to fourth level effects in the great temples of Aegypt, to third level effects in most of the world, to second level in areas of great desolation where the demons have had the most impact, and only to first level effects beyond the Walls of the World. Arcane Magic draws on the power of the Spawn of Apophis – and even at it’s peak is normally a weak and feeble thing compared to the glories of the Gods. Arcane Spells of up to fourth level may be cast beyond the Walls of the World, spells of the third level may be cast in places of great desolation, of the second level in most of the world, of the first level in Aegypt, and they cannot be cast at all in the great temples of Aegypt. Worse, it invariably has corrupting and destructive side effects, whether on the user or the environment. Psychic Powers draw on the user’s personal energies. Unfortunately, humans don’t have all that much of those, hence psychic powers are limited to lower-end Witchcraft and (after long training) second-level psionic effects. 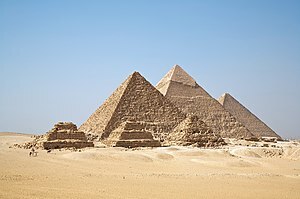 A variety of secondary power sources – pyramids which concentrate the natural energies of the land to empower nymic (“heka”) magic, veins of crystal which store the power and magic of the Sun, and similar structures, items, and places, can also power magic – but their capacity is always limited and few can power effects of above second level – although the Great Pyramid can indeed power third level effects. The population is generally human, and uses the basic rules for a human being unless otherwise noted. The people of Aegypt are indeed the chosen folk (or at least the ones in the magical center of the world); they may all use a variety of lesser magical devices (Charms and Talismans, although it’s somewhat dependent on their social rank and role, 6 CP), they gain a second bonus feat (6 CP), they radiate Presence (an Inspiring Word aura affecting their allies. This also provides some social benefits among the other races, although everyone in Aegypt is used to it, 6 CP), and may practice any type of “magic” within the limits of the setting save for Arcane Magic and Shapeshifting. They may not, however, use “advanced” technologies – such as iron, siege engines, windmills, improved sails and ships, and so on; the Gods have shaped their society and their forms, and so shall it remain*. Their culture tends to be easygoing and fairly classical – which is why they’ve been forced to adapt some Roman and Hellenistic notions to re-organize their society for war. They do tend to disapprove of demon-worship (even in the vague guise of “Other Gods”), but it doesn’t really matter NOW. The damage is already done. *The general technology of the world is Romanesque – although there are occasional devices made possible by magical materials that could fit into considerably higher technology levels. The peoples of the Young Kingdoms may use a smaller number of Charms and Talismans (3 CP), but automatically gain two skill points per level instead of one (eight at first level, 3 CP) and gain a +2 to an attribute (which one depends on their origin, 12 CP). They may use Arcane Magic, and have limited access to other types of supernormal abilities depending on their origin. They may not, however, practice divine magic beyond the most basic levels or study more than (Wis Mod) types of magic in total. They have mostly retained their cultures; the switch from Roman to Aegyptian overlords really hasn’t made that much difference. As far as the Aegyptians are concerned, the Gods told THEM how to live; if they’d wanted to give directions to the people of the Young Kingdoms, presumably they would have done so. The Beastmen of the Wild Reaches cannot (normally) use Charms and Talismans, but have a limited form of shapeshifting (that can be improved on) resembling Lycanthropy (a 15 CP package – although an exceptionally valuable one due to the attribute bonuses of anthropomorphic forms) and gain two skill points per level (eight at first level, 3 CP). They may only use a single other field of magic however, although they may choose between arcane magic, secondary power sources, and personal energies. They’re primarily tribal, although there are a number of minor variants (gothic, celtic, etc). Unfortunately, many of their tribes are heavily demon-influenced. Sadly, I tend to have more ideas for games than I’ll ever have time to actually run. Ah well! They can always be used in the Manifold setting.